A few blocks from our hotel, Nelson Mandela strides confidently across the Museon plaza. Instantly recognizable even from a distance, he cuts a larger-than-life profile. Perhaps that is the sculptor’s intent. 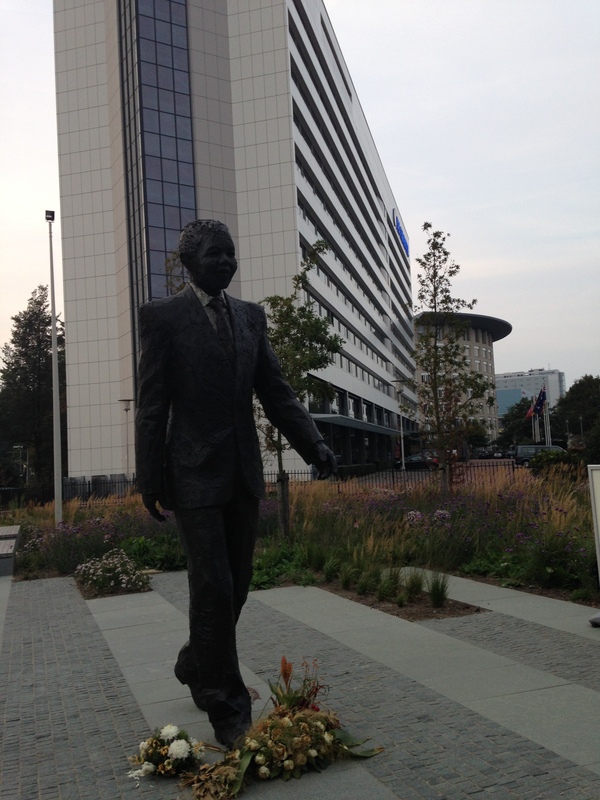 Long before and long after he received the Nobel Peace Prize, Mandela towered over the international scene. Those who walked with him grew taller themselves. As the human face of the anti-apartheid movement, his moral and political credibility called others to become larger and better versions of themselves. Less well known than his struggle against apartheid was Mandela’s focused commitment to destroy South Africa’s chemical weapons and to ensure that chemical and biological weapons would not become available in other countries. Gone from us not yet a year, Mandela’s ability to lift human expectations endures. Serendipitously, this photo captures another Nobel Laureate as well. The round brick building in the background is home to the Organisation for Prohibition of Chemical Weapons. 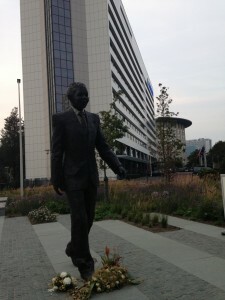 Unlike Mandela who now rests from his labors, the OPCW does not. Today’s queue of dignitaries and office workers moving through OPCW security is testimony to the activity within its walls. As those of us participating in the OPCW conference wait our turn, there is time for reflection. Since the OPCW won the Peace Prize a year ago, its mission to eradicate chemical weapons has made great strides. Only six countries (Egypt, Israel, South Sudan, Angola, Myanmar, and North Korea) still stand outside the boundaries of the international chemical weapons convention. On a drearier note, the challenge to prevent the use of these weapons by rogue elements looms larger, especially with the rise of ISIL in the very region where chemical weapons were unleashed as recently as last year. With these goals of eradication and prevention in mind, OPCW’s original mandate was more recently expanded to include public outreach and education about chemical weapons. It’s not far-fetched to imagine that an energized global populace might be a powerful means of pressuring remaining states to sign the convention. It might also be a means of making the use of chemical weapons unacceptable in the eyes of non-state actors who care not at all for formal international treaties or entreaties. That, of course, is the purpose of this OPCW conference called “Education and Peace.” Officials from the nearby city of Ieper/Ypres, Belgium (which suffered the first use of chemical weapons a century ago), give powerful voice to the promise and the possibilities. Educators from Algeria, museum staff from Iran, chemical engineers from Costa Rica, government officials from Argentina, and Nobel Peace Center staff from Norway all convene to explore a new and vigorous approach to education. Who is the audience? What are the messages and the media to be employed? Which human faces today will galvanize popular sentiment and make the inhumanity of chemical weapons emotionally tangible, even as Mandela became the human face renouncing apartheid’s inhumanity? The OPCW’s specific intent is to use the visibility of its Nobel Peace Prize and the 100th anniversary of the first use of chemical weapons as opportunities to permanently free the globe from chemical weapons. With the OPCW Director General giving a Laureate address at the March 2015 Nobel Peace Prize Forum, the Forum’s attendees will be participants in the ongoing discussion of these questions. Nelson Mandela, walking just down the street with his eyes fixed on the future, would approve. Former Executive Director Maureen Reed writes from The Hague, where she was participating this week in the OPCW’s conference on Education and Peace.